In an area rich in fishing traditions like Northern Minnesota, first ice and the opening of the ice fishing season is as important to some as the spring fishing opener is. It's a time of the year that is a mystery to most of the folks who’s fishing time ends with the summer. While lots of folks are watching football and practicing their favorite couch potato positions, icehouses gather on shorelines as paper-thin ice slowly forms, gaining strength to support the traffic that is soon to come. For die-hard ice anglers, this is the eve of the "real fishing opener" and for the next few months, they'll spend most of their free time on the ice. Do they know something we don't? You bet they do! Early ice provides all of the makings for a dream trip. Hungry fish gathered in large groups, decent weather and best of all, easy drilling! First ice is really an extension of late fall. Fish locations remain fairly stable as they continue their fall feeding binge in preparation for the long winter to come. Fish that have gathered in preferred feeding areas will remain in these locations until fishing pressure and weather conditions force them to move on in search of better opportunities. Before I say another word, let’s start with safety. There’s not enough fish in the world to make it worth you or your fishing partner risking your life on "bad ice". Anxious anglers are sometimes known to push the limit and even experienced ice anglers can get into trouble when they’re not thinking. Safety is always the first concern. Early ice fishing is a team sport, always go with partners and make sure you have agreed to stay near by, but spread out far enough to distribute weight over a safe area. Never leave shore without a safety rope, throwable boat cushion, a spud for checking ice thickness, and handspikes like the Life Guardä Spikes offered by Strikemaster. Wear the spikes by attaching each one to the same rope and stringing them through the inside sleeves of your coat, behind your shoulders so they hang at the ready from each wristband. If you need them, they’ll be there. Use the spud as a probe punching the ice ahead of you and if it ever breaks through easily, find a different route to your fishing area or turn back. Always follow rule number 1! If you’re not sure there’s enough ice ahead of you, don’t go out there. One nice thing about early ice is that you can travel light. A sturdy sled that contains a couple of buckets, a few rods, portable flasher and maybe a small portable heater is really all you need. For early ice of six to 15 inches, a hand auger will drill all the holes you need. A 5-inch Lazerä hand auger is fantastic for this job and cuts the ice like butter. Power augers will come in handy later in the winter, but for now, they’ll slow you down. Protect your blades, keep them sharp and you’ll have more time to fish and less cargo to worry about. A travel tip that you’ll like for carrying minnows is to put some in a zip lock bag with a little slushy ice water instead of using a bucket. In the cold weather, minnows will stay alive all day long in the bag and it’s a lot easier to carry around. Just don’t let them freeze; keep them in your coat pocket or in a small cooler in between bait changes. Early ice is a great time for multi-species trips because it’s tailor made for fishing small, protect lakes and there’s often one species biting during daylight and another one that perks up toward evening. There are a variety of combinations possible, but here some tips on a couple of my favorite combo trips. 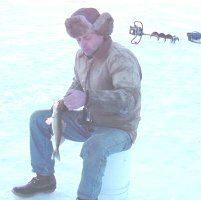 The Perch and Walleye trip during early ice is a medium to small lake pattern and the action can be good for both fish at the same time. But most often the Perch will bite during daylight hours and the Walleyes will move much better toward evening. This early ice pattern is different from most winter Walleye fishing in that it focuses on the shallow weedline fish rather than the fish located on the deeper humps. These deeper structures will be good producers within a couple of weeks, but this first ice shallow bite is reliable and these spots are a lot easier to get to, especially on foot. One of my all time favorite ice spots for Walleye is a small gravel point adjacent to a patch of cabbage weeds in five feet of water within a couple of blocks of the landing. You don’t have to go a long way to find fish because many of these shallow areas still hold bait and fish remaining from the fall runs. Shallow breaklines near large weed flats, clam beds or gravel bars and points along the weedline are like gold and many of them will produce fish year after year. Perch will usually be located up on top of the shallow flats during the day and an active approach, drilling lots of holes will be best. Occasionally take a look at the drop off areas and deeper points adjacent to these shallow flats. Active fish bite within a few minutes, so we don’t spend much time in un-productive spots. Jigging baits with treble hooks like the Swedish Pimple or Jigging Rapala should be tipped with a minnow head. Swimming Jigs or plain jig heads with single hooks are best tipped with whole minnows. We jig actively, sharply lifting the jig and letting it fall back just above the bottom. Lifting your jig from the bottom and holding it there will often trigger the fish to follow it up. Watch your flasher screen like a hawk and be ready to tease these following fish by lightly jiggling your rod tip. Walleyes are often present near the same locations as the Perch. They might be a little deeper or holding more tightly to the drop off. These fish can be seen on the flasher, but not often caught during the day. By late afternoon as the sun goes down, they will bite for an hour or so and the action can be fast and furious. Your best bet is to keep track of areas where you’ve spotted fish during the day a take your best educated guess of where to set up for the evening. It’s important to remember you won’t have a lot of time to fool around. I like to have holes pre drilled that range a few feet in depth and cover the structure in a variety of ways. For example, I’ll have some holes near weeds, some on the drop off and maybe a couple on a shallow point. I always drill the holes in pairs so I can fish two rods within easy reach of each other because it can be important to vary your approach on these late afternoon Walleyes. One great approach is to rig one rod with a slip bobber, split shot sinker and a plain hook tipped with a larger lively minnow like a Rainbow Chub, Golden Shiner or Red Tail. Fish this rig in one hole while you jig more actively in another hole. We’ve seen lots of fish come in to take a look at the jigging spoons and then slowly swim away. Some of these "lookers" spot the bobber rig and stick around for the easy meal on the other rod. You could do the same thing using tip ups, but it takes longer to get them set and I’d rather use the extra time to fish. You can leave the bobber rig set as you check some of the other holes with your jigging rod. Once you find the best area, re-locate the bobber rig and repeat the process if needed. The Pike and pan fish combo is my favorite early ice trip because it’s perfect for small lakes and it provides lots of action with frequent moves. You’re busy all day long, so staying warm is easy plus you get a good look at the layout of a lake. Start by finding the weed edges along the shoreline. It’s best to find the outer edges where moving Pike can easily see your bait along the breakline. Water depth will be 6 to 12 feet on most lakes, maybe a bit deeper on some. Set your first couple of holes with tip ups rigged with a 3/8-ounce egg sinker, barrel swivel and a 2/0 hook tied to a 24 inch, 17 to 25 pound test monofilament leader. Once you have a couple of tip ups set, move down the breakline about 25 yards or so and drill your next hole, remove the tip up from your first hole and re-set it at the new location. Continue this leap frogging or trolling down the shoreline as you search for the most active locations. Early Ice is a great time to gather some "eaters" for one of those early winter fish fries. They sure taste good after a few months without a meal of fish. As you watch your tips ups, make short trips into deeper water and check for schools of Crappies or Bluegills on your flasher. There’s no need to drill holes for this, just put a little water on the surface of the ice and set your transducer in the small puddle. You will get a good reading through the ice. When you spot schools of fish in the deeper water, make note of these spots and prepare holes in these locations. As late afternoon approaches, remove your tip ups and head to your pan fish locations to prepare for the traditional evening run. Simple slip bobber rigs using small ice jigs tipped with minnows or wax worms will be a good starting point. I use my flasher religiously to locate fish and help determine how active they are. When you spot fish on the screen, raise your jig just above them and watch how they react. Active fish will come up and bite immediately. Less active fish may take a look and swim back down. Move from hole to hole and check back on the ones where you’ve seen the most fish. As a rule, there will be a spurt of action just before dark and it pays to be in the prime locations when it starts. 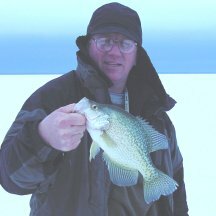 First ice is a great time to enjoy most everything ice fishing has to offer. Travel safely and enjoy a few of these early winter outings. You’ll come back for more.